Antiques experts travel the UK searching for treasures. James Braxton and Helen Hall travel from Newport in the county of Gwent to auction in Wotton-under-Edge in Gloucestershire. Browse content similar to Episode 27. Check below for episodes and series from the same categories and more! It'll be a good profit. 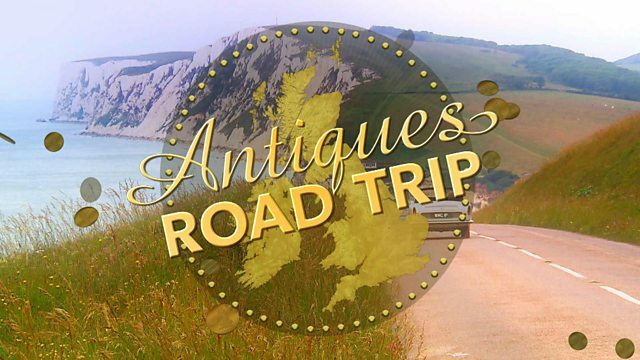 THIS is the Antiques Road Trip! and new kid on the block, Helen Hall. It burns a hole in my pocket, always has. to go out of her comfort zone to bag a bargain. Oh, sewn together by the mouth. I daren't put that on. knows the secret to Road Trip fulfilment. If I could secure that for a fiver, I would be a happy man. -Oh, it's running very well, isn't it? It's a pleasure to drive. It's gorgeous. I want one. -Very silky smooth, isn't it? -It is. I want one. That's it. ..but Road Trip veteran James showed her how it's done. Now, THAT is a goodie. saw his war chest grow to £250.98. meaning she has a bit of catching up to do. -How did you enjoy your first auction? -I did, I loved it! Yeah, it was fun. Yeah. -it's the taking part, isn't it, James? Yes, that, and winning, of course. ending their road trip in the county town of Lewes in east Sussex. for auction in Wotton-under-Edge in Gloucestershire. -Well, that would be nice, yeah. Glossy-possy? What's he going on about? city in Wales, after Cardiff and Swansea. overnight on the nearby hills before attacking the next day. our duo are ready to do battle for the best bargain. Stand by. name for a place with an equally interesting array of antiques. Here we are. Sheffield, Helen's county, top of Derbyshire there. Could be useful for the trip home. James' pockets are bulging with cash and he's eager to spend it. -I want to be spending £50-£100 and that's where the profits lie. So, it sounds like he's prepared to spend big on this leg of the trip. Is this the sort of thing James is after? Quite a nice dress set, isn't it? and you would put it through and they were dress studs. So, evening dress for dinner jackets and everything. -That's rather fetching on you, James. but it's just a nice little set of dress studs there. They're nice, aren't they? Not the most glamorous of cases. but it's got a nice velvet interior with the silk. Beautiful how they used to make these boxes. there's the small matter of the £49 dealer John wants for them. -Could you do it for £25? -I'd do it for £35. -Price, John. It's that nutty thing, isn't it? -Dear, oh, dear. Wouldn't it be lovely if there was no prices? -Could you get near my £25? -£30? They're rather nice. £30. John, thank you, that's very kind of you, thank you. but it's a start and they are gorgeous. Helen has made her way eastward to the town of Chepstow. -She's beginning her shop at St Mary's Street Collectables. -but can Helen find something here she likes? My eyes are drawn to that, being an entertainment memorabilia specialist. My eyes are drawn to that but it's... Yeah, it's a reprint. Of all the antique shops in Chepstow, you walk into this one? Helen's doing a lot of browsing. -Nothing seems to have captured her attention. -Oh, look, a crystal ball. What does the future hold? Will I make a profit? Not unless you buy something, love. Yeah, you know, I'm thinking I might save my money. I went all out on the first shop last time and bought, sort of, four items. I'm thinking I might save myself. -Well, hang on, because I had one item in yesterday that might interest you. -So, come and have a look. Oh, she's a good saleswoman, that Dawn. -What on earth is this? -She's a little bit sad. -She's a little bit scary! A doll! What will James say if I come back with a doll? -You need to catch him first, Helen. They are very scary, but she's got quite a sweet face. -THAT is a matter of opinion. can be highly collectable, even in poor condition. it still has all its parts, it could prove attractive to a restorer. the original clothes. I mean they look like they're original to me. in really great condition considering the age. So, you know, if someone restored that, it could be a really nice little thing. -What are you going to say on it then? -The very, very, very best is £5. Oh, lordy, she's not really going to buy it, is she? Oh, do you know what? I'm going to take a punt on her. -Yeah, £5, can't go wrong, really. Yup, Helen's just spent £5 on a somewhat dishevelled doll. and of course it's worth a good deal more than that. an industry that was once one of the cornerstones of the Welsh economy. -and meeting former miner, Kerry Thompson. -Hello, very nice to be here. important coal-producing countries in the world. with many more dependent upon it. pit in the area, allowing much more coal to be extracted. And how many people would actually work at this colliery? the Blaenavon company, there was probably about 2,000 men working. 2,000 men? Goodness! What does this coal do? It wasn't just for people's fireplaces. -We're talking about the age of steam, aren't we? And of course coal was found to be the best way of raising steam. was stocked for ships to come in so they could go somewhere else. And the biggest and the best known of course is Titanic. That was run on Welsh steam coal. sort of the scale of the industry. one of these of course is a wagon which holds up to about ten tonne. Really? Ten tonnes of coal?! and that's just one moment in time. but as the 1877 Tynewydd disaster showed, that came at a human cost. Kerry, what are we standing in front of? Well, this is one of the most famous mining disasters in Wales. because there was only actually five people killed in it. because of the way the accident happened. without water, in freezing conditions. Obviously where they were, you know? And they were actually trapped in a bubble basically of compressed air. it's like shooting a gun in an aeroplane, isn't it? -Compressed air shoots you out. Thankfully, most of the miners were rescued safe and well. the first time such a medal had been awarded for saving life on land. couple of feet of coal. strike in the 1980s, nothing could halt the industry's slide. across the whole of Wales, mainly in open-cast mines. it's still here as a reminder of how Wales was built. time IS running out to find a bargain. and has popped around the corner to Halfway Trading Antiques. -from antiques to modern jewellery. Oh, you've got some lovely things. Oh, a bit of flattery to soften dealer Kelly up for a discount, eh? Erm, this is a nice little chair with the caned seat. and it does look quite original. '30s or something like that from the style of it. Yep, so it does look like the original seat on it. -Yeah, it's unusual. I like that. It's sweet. -How much are you asking for it? -I was looking for somewhere around £75. -OK. We'll think about that one. -Hmm, she seems quite interested in that. Well, that would be fun for Gloucestershire. A cider...pourer? A cider pourer, I guess? Kind of like this. This is quite fun. But you know, copper, I don't want to pay too much for it. -Essentially, I don't want to pay too much for it. -Would you take a tenner for it? -Yeah, go on, then, yes. -Did I start too high? She said that too easily. It's yours for just a tenner. Her second item is secured, although I don't think she's done yet. I still keep thinking about that chair though. I do think it's nice. I've got to be careful, though. I've got to save my pennies a little bit for tomorrow. I don't want to spend everything today. So you said £75? I couldn't go anywhere near that, really. I'll do it for you for £40. That's nearly half of what I expected for it. I'm in two minds about it. Would you do it for £35? -Cor! She's driving a hard bargain. That's less than half price. So £35 for the chair, tenner for the cider ladle, £45 altogether. -Yeah! All right, I'll do it then. The cider pourer and the oak chair for just £45. Right, I'd better carry this chair now. Very carefully. Mind how you go then, Helen. As the sun sets, I bid thee nighty-night. -It's day two on our Welsh road trip. -Well, Helen, this is Cardiff. Cardiff Castle on our left, beautiful. Yeah, it is fabulous, isn't it? the six gold studs, leaving him £220.98 today. -Thank you, that's very kind of you. -Helen's spent a tad more. in England, and they've made their way to the Welsh capital of Cardiff. Well, Cardiff's really on the up, isn't it? they've got a very good rugby team. Whilst diamonds ARE forever, time to shop is definitely finite. and it's not for fuel. -Brilliant. Well done, well driven. -That was a nice drive, wasn't it? -I don't want to get out of it actually. -Oh, buck up, you two. and it's now home to about 50 dealers. Nice. which of our cohorts will bag a bargain from dealer Keith first? -I literally could spend a fortune in here. Nice military cap. Does it suit me? -Yet again, what I'm looking for is a bargain. They're lovers. There's one hanging off the back there. Three's a crowd and all that. Oh, sewn together by the mouths. I daren't put that on. Ew! -If you think they're frightening, wait until you see this. Simba, the film and television lion. And he's been stuffed for posterity. Look at him. -I would not mess with that. Yesterday, James said he wanted to spend big to maximise his profits. I wonder if he's found something to really sink his teeth into. I like this table. Now, why do I like this table? is it's got something extra to it, and that extra are these. But these are just extenuating the design. It is after a chap called Edward William Godwin. but also the furniture that would've gone in them. the maker has been influenced by Godwin's neo-Japanese work. And what's it priced at? £55. £55, for something that is after such a famous designer. -there might be a good profit. -I think he likes it. James has spotted the dealer's phone number on the wall. Hello, Jackie, it's James Braxton. the ring-turned legs. What could you do it for? Is there some movement there? OK, well thank you very much indeed, £35 it is. Very good. In fact, funnily enough, I thought I was going to offer £35. £55 to £35 and sold. He seems happy with it. Helen, meanwhile, is still browsing upstairs. This cranberry glass sugar sifter. These are nice because they're silver hallmarked lids. Might go down quite nicely at auction. Helen did well selling one of these at the last auction. Is she thinking it's a safe bet then? -So that one's nicer because it is hallmarked silver. -Do you know your hallmarks off by heart? -Do you? Brilliant. You're the man. -Looks like a Birmingham one. -It's going to be solid silver, that would be. -So it's got £38 on it. -Yeah. I'm sure we could come to a decision. -I'd like to make a really cheeky offer. And say £18 and see what they say. See what they can come back with. -Erm... It's a bit tight. -It is a bit tight. -Helen's looking for £20 off. She's not shy, is she? Keith has to run it past the dealer who owns it. -I wonder if they'll take Helen's offer? OK, all right, OK. I'll think about that. the rest of the store, but thank you, I appreciate that. Hmm. Clearly the extra £2 the dealer wants is crucial to Helen. presumably still looking to make that big purchase he's after. Feel the weight of this. This is a real slab of earthenware. Known as an encaustic tile. when the body of the tile is worn, the design remains. the great designer, was very much at the forefront. used for the pavements, for the thoroughfares of churches. But this is a lovely design. A great repeat design. Something that Pugin would have designed. Just really nice detail here. Minton and Co Patent, Stoke-upon-Trent. Centre of the ceramics industry, a great item. -If I could secure that for a fiver, I would be a happy man. What happened to your strategy of spending big then, James? But we do want to see you happy. -Question is, can Keith make it happen? -Keith, this is the baby. Right, OK. It's unmarked, hasn't got a price on it. I'm rather hoping I can get it for a fiver, but we'll see. Terracotta tile, yeah, it is, yeah. He's interested to know if he can buy it for £5. £5 is fine. -Great, thank the man. Fiver for that and also I rang Jackie. -OK, thank you very much. -£40 in all, that's really kind, thank you. My goodness, that man likes a bargain. Now, can Helen find something to put a smile on her face? Love that. Is that heavy? Let's see if I can get it out. This is a gorgeous fire screen. But look at the design of it. hanging onto the Art Nouveau movement a little bit. I'm a big fan of Arts and Crafts things. It was very much sort of in the British tradition, you know. and I really like that sort of Britishness of it as well, you know. like it's had any bits welded back on or anything. What are they asking for it? and get it for about £50 if I can. You can only ask, but it looks like Keith might already know the answer. ..to Mandy and apparently the price she wouldn't take lower than £60. Really? OK, what are we going to do? -No lower than £60. She's not budging, is she? -but if she's not here then we can't have that conversation, can we? -I think I'm just going to go for it because I like it. And I'll keep my fingers firmly crossed. £60, all right, it's a deal. And then the sugar sifter as well, I think I'll go for that too. -So that's £60 plus £20 so I owe you £80. James is still shopping and has made his way to Avalon Antiques. -Nice to meet you, I'm Gitty. Gitty, very nice to meet you too. Gitty, I need to buy two items. -Hoping to make some money. I think she knows the game. I've watched this programme occasionally on the television. -A fan, hey? Isn't that nice? There's no business like show business, eh, James? -Can I look at your Delft bits? I thought you might want to look at those. There are three of those. I mean there's not a pair. or around Delft in the Netherlands from the 16th century onwards. These look like they're a bit later. Probably 19th century. Actually they're quite alike, aren't they? They are quite alike, aren't they? With this moulded detail. You've got the sort of moulded cartouche and then the peonies. -they're going to have a bit of damage, aren't they? It's got some age, hasn't it? It's suffered the rigours of time. Something I think we can all relate to, eh, James? Rather nice, aren't they? The insets there. I quite like those. -Well, that's a possible candidate. -Right, that's a possible candidate. OK.
and he doesn't seem too keen on anything else. With the shop closing soon, would he find something he likes? You can go and have a large gin and tonic shortly. -I'll need it after the prices you're charging. Aw, James, I know you didn't really mean that. -You can't rootle in the back. -There's always room for rootling. -Yeah, get rootling, as you do. I feel like a mole down here. -Shall we have a quick look at that? but I suppose it all depends on the price. -I quite like this sort of title plaque here. -Trent Maritime Company Limited - London. -It is rather nice, isn't it? This painting of the cargo ship Duke of Mistra is by George Wiseman. and '60s, often working from shipyard plans to ensure accuracy. A nice watercolour. It's just a really nice, clean item. It's all framed, exactly as it would have been done. so that's the way to keep a watercolour. -and they've got a great bit of marine ply on it, haven't they? expect a shipbuilder to do. -No, no, I don't think so. -This is £230, but I'm sure we could do a bit better than that. -You'd have to do a lot better than that. You HAVE been watching the show. a deal for the painting and the vases, which are priced at £98 each. See, Gitty, I'm still drawn to these. I might be making the most terrible mistake here. -That's all right, I'll let you. I would do the two for £140. And I think you'll make on that. -How near to £80 could you get on that? -I can't do £80, no. Well, if you have that for £120, I will do those for £120. How is that? -So that's £240 in all? -but I could buy something cheaper I suppose. So that would be £90 for that and £90 for that. I think you've been very fair and I'll very definitely do it. -Thank you very much indeed, Gitty. That's nearly £200 off and almost all his cash gone. Not a bad way of rounding off James' shopping though. -And I'm all spent up. Earlier, James was hearing about how coal once drove the Welsh economy. helped Cardiff grow from a tiny village into a major city. She's visiting Butetown History & Arts Centre. -Hi, I'm Helen. Lovely to meet you. Oh, pleased to meet you too, Helen. Welsh coal was in demand throughout the UK and the world. and ill equipped for international trade. Rich landowner John Crichton-Stuart saw an opportunity. And so who was John Crichton-Stuart? He was the second Marquess of Bute, he owned the land. dock to export the coal that was coming from the South Wales valleys. -to bring over 200 men from Ireland to build the port. -Yes, down at the seafront. When the West dock opened in 1839, Cardiff's global trade links grew. from all over the world, some of whom settled within the community. The ships were going as far away as China. And when the ships returned, there would be Chinese crews on board. imagine married locally and so this was their home port. so did the levels of dirt and pollution. leaving their homes to the new emerging community. Well, now, Helen, we're down at Windsor Esplanade. and the bosuns lived back in the sea-going days of Cardiff docks. Tiger Bay became a melting pot of people from all over the world. It was one of the first truly multi-ethnic cities in the UK. but came to the bay in about 1897.
is still home to Neil. So what was it like to live here in the docks, because you grew up here? I lived on a street which had many nationalities. Despite our disparate ethnic backgrounds, we were all Welsh. Tiger Bay has been welcoming people from all over the world. and is now known as Cardiff Bay, a centre for leisure and commerce. it's still finding new ways to bring people to the area. -Thank you for having me. -It's a pleasure to meet you too. it's back to the history centre to reveal all. we're going to a land-locked county to buy a marine scene. -Excellent, OK, yeah. Very appropriate. The ship is just a shipping ship, it's just a cargo shipping ship. I think that means he has no idea. But it's a cargo ship and commissioned by the then owners. It's got a nice sort of title plaque here telling you all about it. -1960 going past Dover Castle. -And I'm all in! 98p left. -What did you pay for those? They're nice though, aren't they? -Helen seems impressed, but what will James think of her lots? -Look at this! She looks quite a nice doll. -I was coerced into buying her. -and in nice condition, they can make about £200 or £300. -And how much did you buy it for? -That's a good profit. That's good. this is a cider ladle. -With, you know, "cider" on the front. -Very good. Very good, cider. Paid a tenner for it which was probably a bit much, but never mind. Helen, it has been hot, hot in Wales. -so it brings the bidders out. -I know, we need that. -Anyway, in the meantime, ice cream? Before you go and chill out, tell us what you really think. Erm, difficult to know, really who's got the best kit. -it's not that vintage a piece. It's fairly recent. I think that could make some money, that. Only a £5 note and the eyes look great from where I was standing. Just how close were you standing? The town sits in the Cotswold Area of Outstanding Natural Beauty. The question is, will it bring an outstanding profit to our jolly chums? -This looks very good, good omens. It's quite hard getting out of that in a skirt, you know! -You should try it sometime. The scene for today's auction is the Wotton Auction Rooms. and at this wonderfully restored church for over 30 years. is in the podium today. What does he think about our team's items? a bit of a heebie-jeebie moment, but she will string back together. but the head is sound so that's the important thing. James' shipping portrait is good. so we'll see on that one. If I were a betting man, who would I put my money on? I think it's going to be a very tight-run race. I think there will be just a few pounds between it. It's a cop-out, really, but I think it will be a very tight race. and has gone on to spend £250 on five auction lots. Yet again, what I'm looking for is a bargain. -Thanks for that, it was nice to meet you. and it's going to get even hotter as the auction begins. First up is James' encaustic tile. What do we say? £10 to start for it. £10 to start. £10. £5 I'm bid. Thank you at £5 I'm bid and £5 I'm bid, £10 I'm bid, £15 I'm bid. At £15 I'm bid. At £15, at £15, it's sold at £15. An opening profit of a tenner straightaway for James. It is a profit. I'm not going to argue with that. Can Helen do better with her cider ladle? -The £10 lot, £10 to start. -Oh, come on, let's start at £10, come on. At £10 I'm bid. At £10, at £10, £15 anywhere? At £10 bid, cheap enough little lot going through. Are you sure? -At £10, this time at £10. -So, no major loss for Helen. Can James entice the bidders with his mahogany table? -The bid for the table above £30. £50 on the wings I'm bid. We're all finished then at £50. There you go, another small profit, there you go. There's a healthy £15 profit for James. -Someone's got a bargain, I reckon. Can Helen make her first profit of the auction with her screen? -It'll buy you a bottle of wine then. Oh, it's going up, it's going up. £50 I'm bid, £5 I'm bid, on commission here at £55 I'm bid. -At £55 I'm bid. At £55, and it's sold then. -Someone's got a very nice thing there. -A great bargain, haven't they? Just a fiver short, but there's still time to make that back. Can James increase his profits with the pottery vases? for the two, at £30, my only bid for the two of them there. Come on! Come on, up it goes. At £45, at £50, and £5, and £60? At £60 I'm bid, your bid, sir, at £60, I'm bid, at £60 I'm bid. £5 anywhere now at £60? And at £60 and they've sold. -£60. Oh, I'm sorry, James. -It was slightly expected I think, unfortunately. up if he does well with the rest of the items. Revenue is so hard to earn, but it quickly goes, doesn't it? The heat is on for Helen's chair next. At £10, early bid, thank you. -No, bit more, bit more. At £35 I'm bid, at £35 I'm bid. Pretty little chair there. -At £35 I'm bid, £35 then. -Broken even, and sadly therefore no profit. I think you're keeping your powder dry, Helen. taken over and he looks like he's wilting already. Helen's cranberry glass goes up next. and £40 and £5 for you now? £45 I have and £50, and £5 for you? -Do I see £5 anywhere now? -Selling for £50 to be sure. -You needed that, Helen, well done. That more than makes up for Helen's losses so far. -Wow, that's a great profit. £40. £20 in the bin, eh? Next to set sail is James' shipping picture. -£60 for me now, sir? £60 I have. Do I see £5 anywhere now? Selling for £60, £5 I have, thank you. -£70 with you now, sir? -£70 I have and £5 and £80 for you now? £80 I have and £5 for you now? £85 and £90 to come back in now, sir. £90 and selling, anyone to come back in at £5. -£100 do I have? Selling at £100. -Oh, a result, a result. The good ship has found its port, giving James a welcome profit. The auctioneer has changed again, this time Nicholas Ewing is on. -James' last item is next, the six gold studs. -£35, £40? £45? £40's bid. £45 anywhere? £45 anywhere? On my left at £40. -£40, so another tenner in the bin. -£40. Well, there you go. After costs, there's a small bit of profit there for James. I'd say you're slightly in the lead at the moment. And everything to play for. and it's all riding on that crazy little squished up doll. That's right, it is, but will it enchant today's bidders? -So, £20 for this doll. -I think he's saying £20. -Give me £10 for the doll. Surely. £10, 10 for it? £15? £15 anywhere? £10 only. £15? £10 and going, £15 sir, £20 now? -£15 to the gentlemen there. £15, all done, seated at £15. -Oh, that was a bargain. -That was a bargain, wasn't it? You're not kidding. A tenner profit for Helen on the broken doll. we'll have to do the sums. It seems close. Time to tot it all up. thereby winning this second leg of the road trip with £184. -So, not too bad for me. -Diabolical for me, I'm afraid. I think you definitely took that leg. Good on, Helen, her first win of the Road Trip. Next on the Antiques Road Trip, James works up a sweat. -And the heat is on for Helen. On the second day of their trip James Braxton and Helen Hall begin their travels in Newport in the county of Gwent, then head to Cardiff before crossing the English border for auction in Wotton-under-Edge in Gloucestershire.